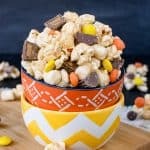 Make a batch of this easy Candy Corn Popcorn Mix to munch on during your next family movie night! This white chocolate covered snack mix will disappear before you know it. So the question I have for you right now is “Do you like candy corn?”. I have come to realize that this little fall candy is a hot topic for most people. You either hate it or you love it. I’m actually a fan of the sweet fall candy. But then again I have a sweet tooth bigger than the state of Texas. If it’s a sweet treat, I’m bound to love it. Now my second question is, “Have you ever eaten candy corn and peanuts together?”. Oh, my word! It’s my absolute favorite way to eat candy corn, hands down. It kind of tastes like you are eating a Payday candy bar, but so much better. Well, in my opinion that is. Add some Reese’s Pieces into that mix, and you have a snack mix that can’t be trusted around me. 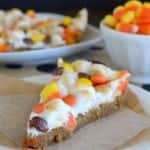 That fun snack mix inspired me to make this Peanut Butter Candy Corn Pizza a few years ago. It’s still one of my favorite treats to this day! So of course, as soon as the bags of candy corn show up in the store, I always a buy a bag or two. Actually, I think there are three bags in our pantry right now if I’m being honest. What? 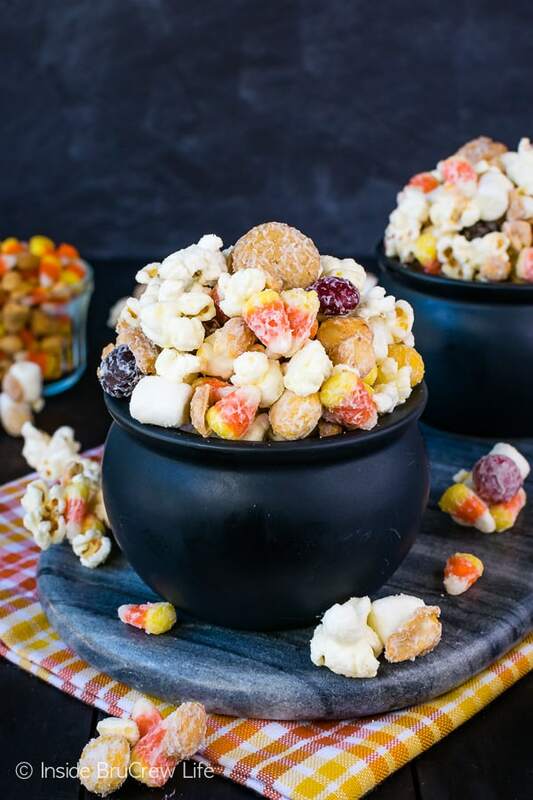 I had to get the mini candy corn for this Candy Corn Popcorn Mix and some monster cookie pops and a bag of the Harvest candy corn for another fun dessert. The third bag of autumn mix was an impulse buy the other day just because I wanted the candy corn pumpkins. My pantry is full of these little impulse buys that I think I might create something with. 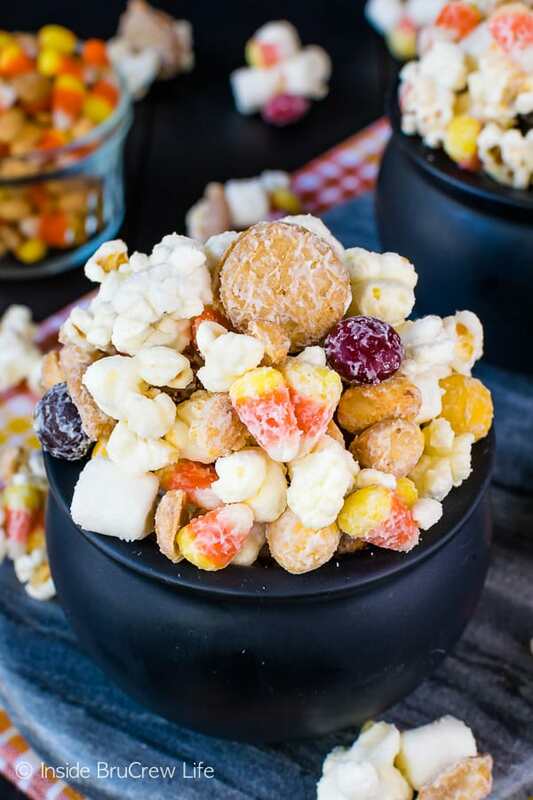 Pack small bags of this snack mix in baggies for a fun lunch box treat. 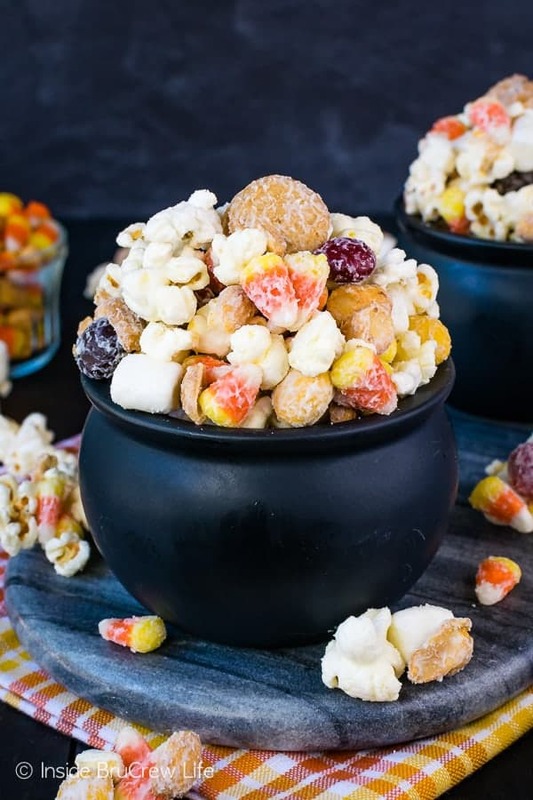 Serve a big bowl at Halloween parties for people to munch on. 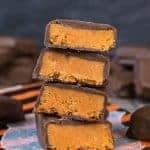 It’s a fun treat to snack on during football games or movies. Package it in little bags and give it as a favor for fall parties. 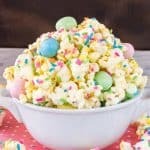 Use your favorite popcorn maker to pop a batch of popcorn. Make sure to remove any un-popped seeds. There is nothing worse than biting into a popcorn seed and breaking a tooth! 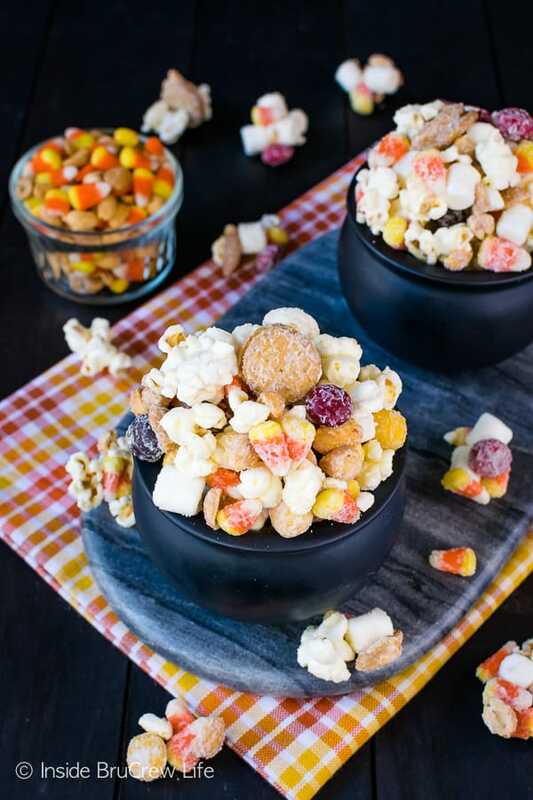 Stir together the popcorn, marshmallows, peanuts, candy corn, M&M’s, and mini Nutter Butters in a large bowl. Melt a bag of white chocolate candy melts in the microwave following the package directions. 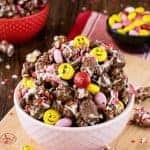 Pour the melted chocolate over the snack mix in the bowl. Stir the mixture together until everything is coated in white chocolate, then pour the mixture onto a parchment lined tray. 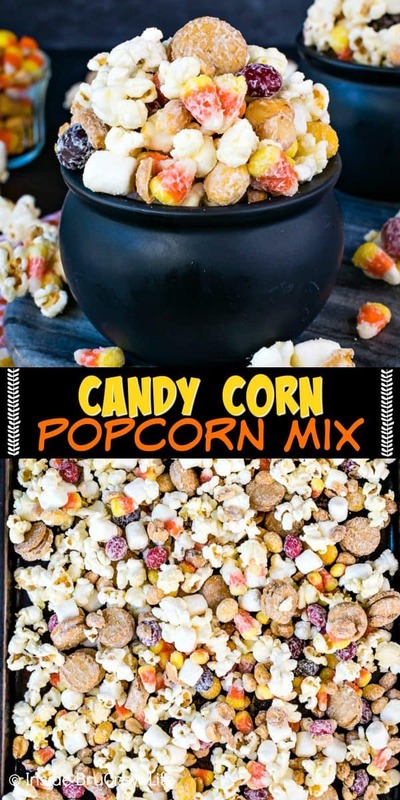 Refrigerate the Candy Corn Popcorn Mix for five minutes. 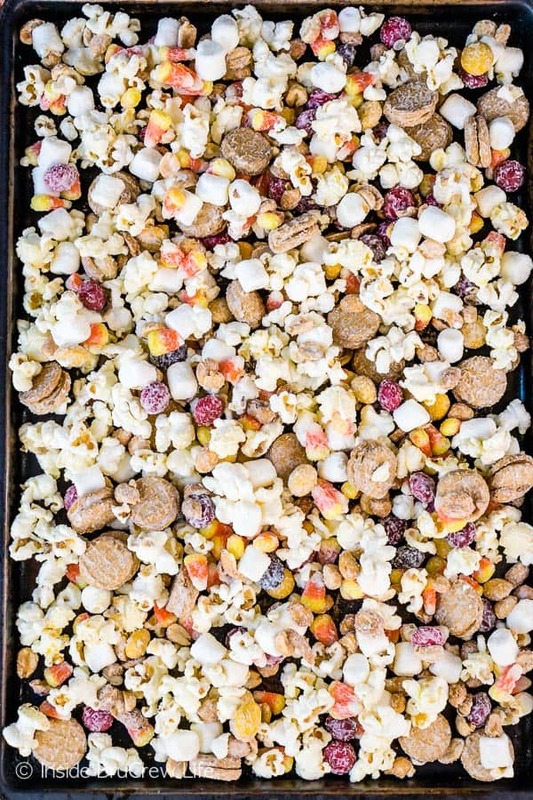 Break the snack mix apart into chunks. 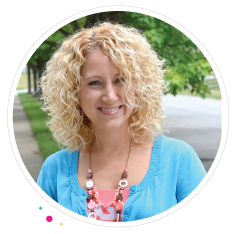 Store it in a tightly sealed bag or container. 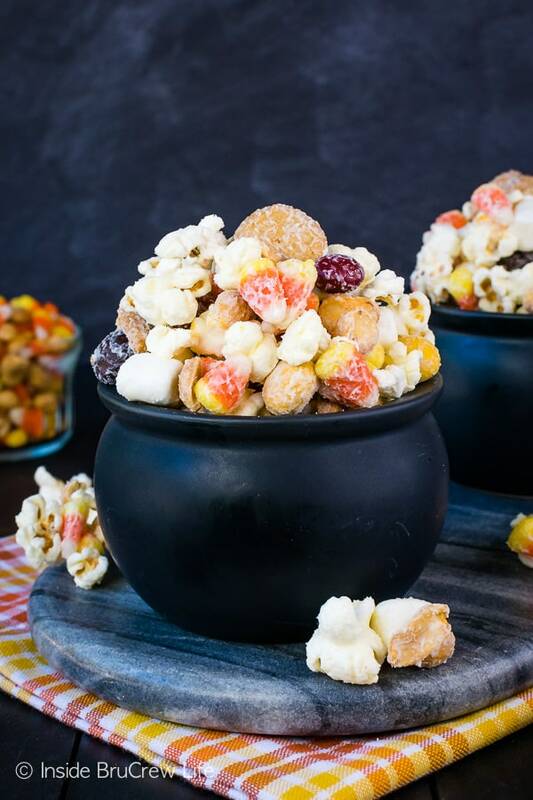 Stir together the popcorn, marshmallows, candy, and cookies in a large bowl. Melt the white chocolate according to the package directions. Pour onto the popcorn mix and stir until everything is coated. Pour the mixture onto a parchment lined baking sheet and refrigerate for 5 minutes. Break apart into chunks. Store in a tightly sealed bag or container. This looks amazing! I’ve recently had some dental work done and all I want is popcorn and then I saw a PayDay at the grocery. 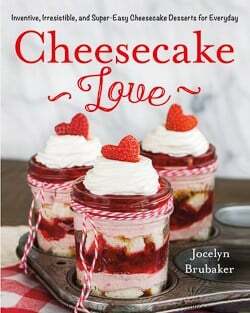 In a few days I’ll be making this and I may share it! LOL! Boo for dental work, but yay for wanting fun popcorn! 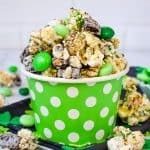 I hope you get a chance to make this fall popcorn mix!! !